Welcome to Manitou Executive Suites, the best value luxury furnished suites Saskatchewan has to offer. Nestled in the heart of the beautiful resort village of Manitou Beach, Manitou Executive Suites, are at their essence a unique and unprecedented merger of quality comfort, elegance and beauty. 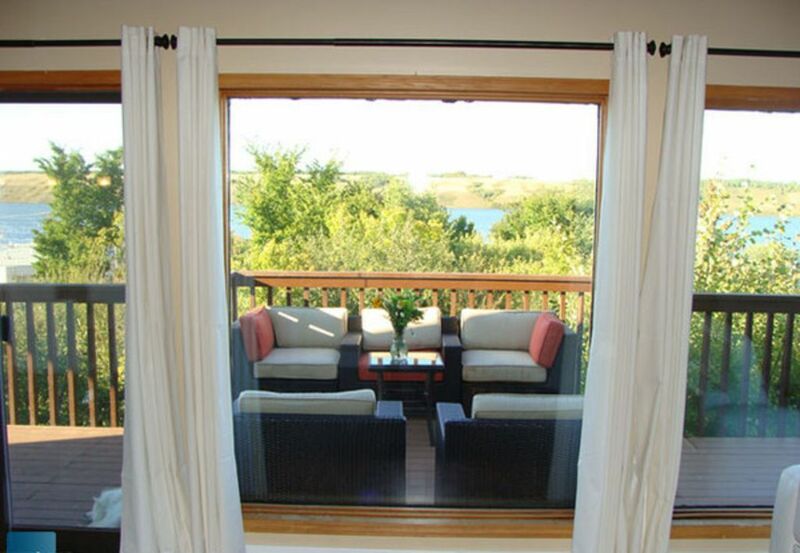 Enjoy a view of the sunrise on Little Manitou Lake from the fabulous surroundings of these exclusive ultramodern furnished suites. Situated on a quiet cul-de-sac, the suites provide unprecedented style and convenience. After a long day, let your stress dissolve in the embrace of the ultra-saline waters of Little Manitou Lake, the northern sister of the Dead Sea. Just steps away, experience the bliss of weightlessness as you float effortlessly in the year-round spa... your joints and muscles will be eternally grateful. Please keep in mind that these suites are predominantly furnished with state-of-the-art white Italian leather furniture most suited to individuals who love pristine surroundings. The suites are turn-key with all the extras to make you feel at home during your stay. The communities of Watrous and Manitou Beach offer visitors the perfect playground for a variety of holiday adventures. From the highenergy guest who likes to engage in physical activity to those looking for a more restful respite from the daily grind, Watrous and Manitou Beach caters to all. Perfect for individuals, couples and families, the range of available accommodations and activities allow visitors to plan the perfect get-away. With over 200 businesses to serve you, everything from A to Z is only minutes away. Nestled in the valley just a five minute drive from Watrous is Saskatchewan's best kept secret-Little Manitou Lake- the only natural salt water lake where even a goat can float! Come experience the priceless tranquility of nature, set to soothe even the most frazzled of nerves. Fill your days with shopping, swimming, walking, hiking and golfing. Dance the night away at the world famous Danceland. Stroll down the boardwalk. Enjoy the serenity of a campfire at your campsite. Or revisit your childhood or introduce a new generation to the unique atmosphere of viewing a movie at the drive-in. The beautiful Manitou Beach Golf Club offers beginning and seasoned golfers a challenge. Bordered by mature trees, the nine-hole course is a beautiful walk of 3,048 yards, par 36 with a 119 slope rating for men and a 114 slope rating for women. Dotted with bunkers and water hazards, golfers will find themselves booking subsequent tee-times. What summer would be complete without spending some time at a sandy beach! Manitou has three beaches with shower and washroom facilities at each. There are playgrounds available for the kids, so you can relax and soak up the sun. You can try out the legendary waters of Manitou the same way our aboriginal forebearers did--- with a dip in the lake.